It’s hard to gauge whether you’re having an impact. As I near the end of my time here, I was looking for tangible signs that the lessons and experience I’ve been sharing and teaching others were getting through. I waited and hoped something would air that would clearly show a direct benefit of my work with some reporter. Or a student would produce something that would burst forth on the national stage. As I stood in front of a packed house at an event I dreamed up to honor and premiere the documentaries my students produced this year, I knew I had done something right. Here was proof in spades. The auditorium was standing room only. The people cheered after each film ran. 12 intimate and fascinating documentaries flickered larger than life on the screen. Their characters and subjects offered slices of Egyptian life over a wide swath of society. There was a man who irons clothes with his feet — the last of a dying profession. 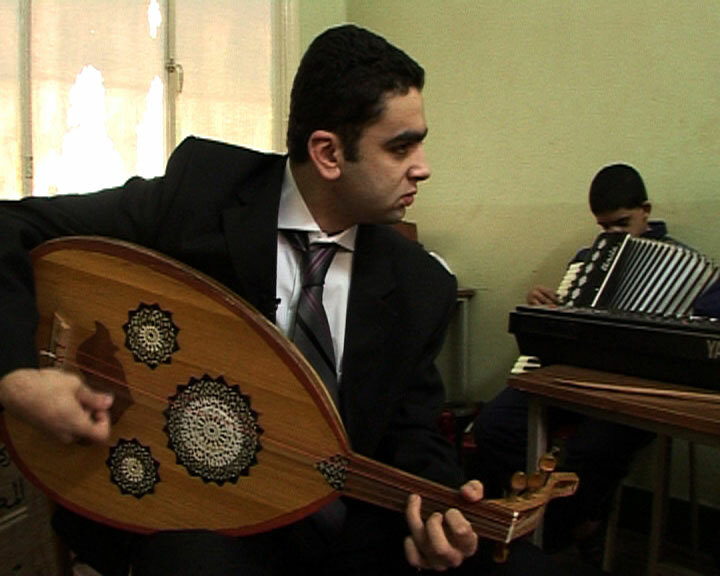 A blind player of the oud, an oriental lute. A top Egyptian potter and his son. A grim inside view of Cairo’s largest charity hospital. An Iraqi woman pining for her country and coping with the hundreds of miles that separate her from her husband. A glimpse into the life of a family of activists, accustomed to violence and prison, but never giving up. A pilot of one of the many feluccas (sailboats) that ply their trade on the Nile. The headmaster of a soccer school. An orphanage run by a former pop star. A jazz band. The Camel Market. A nature preserve in peril. All told with as much assistance and support I could lend them. But it was the work and determination of the students that made them all happen. 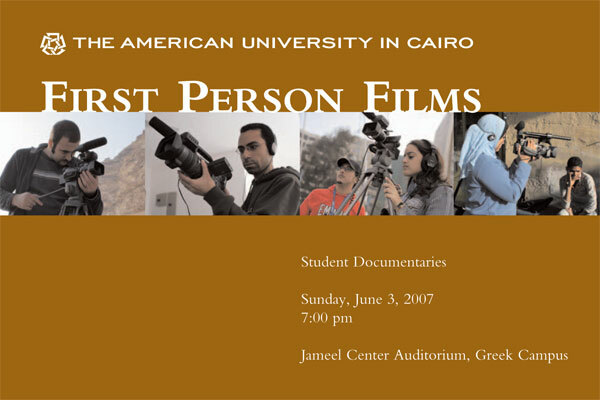 I called the evening “First Person Films,” because I emphasize in my courses the importance of finding good characters to profile. And there is great power in documentaries to relate personal experience and individual stories as a means for exploring the bigger issues. I wanted the event to have a Hollywood sheen. There was even national news coverage (a TV crew from Nile News and various print outlets). No red carpet, but finger sandwiches, lots of applause and good will. At the end, I asked all the filmmakers to come to the front, to a rousing ovation. The Q&A that followed brought up so many important and provocative subjects — from the subjectivity of the filmmaker, to finding characters and getting access. And, even though I’m notoriously bad at names, I remembered them all and said them one by one as the final applause rose in the room, and we ended the evening, the dopamine almost palpable in the air. And later this afternoon, I got a call from one of those Arab channels, showing interest in having the films and the students as guests on a well-known and highly-regarded current affairs program. It made up for the chaos of the previous days. The frantic and tedious chore of putting English subtitles on the projects (though it may have improved my Arabic a bit). The ridiculously late night as one team still burned the midnight oil to finish their piece while I worked in another edit suite to prep the other films for the big night. The technological glitches that delayed me and meant we were still laying the second half of the program to tape while the first half was playing in the auditorium. I’m exhausted. But I’d happily do it again. For them. For me. For the good it does. For all of us. Congratulations to you and your students. I am sorry I missed it, though I will be back in Cairo–just a few weeks too late. Congratulations , Craig, I am sure you see something of yourself in each of the documentaries produced, and this is very gratifying. another chance to for me to be proud of you.